I’m not exactly a bra burning feminist, but this ad genre really grosses me out: Annoying Choco-Promotion; as if high heels, runs in our stockings and big dogs(?) are life’s biggest stressors. Someone getting that much pleasure out of a piece of candy makes me feel like their life (and stomach) must be pretty empty, and that is a super bummer. 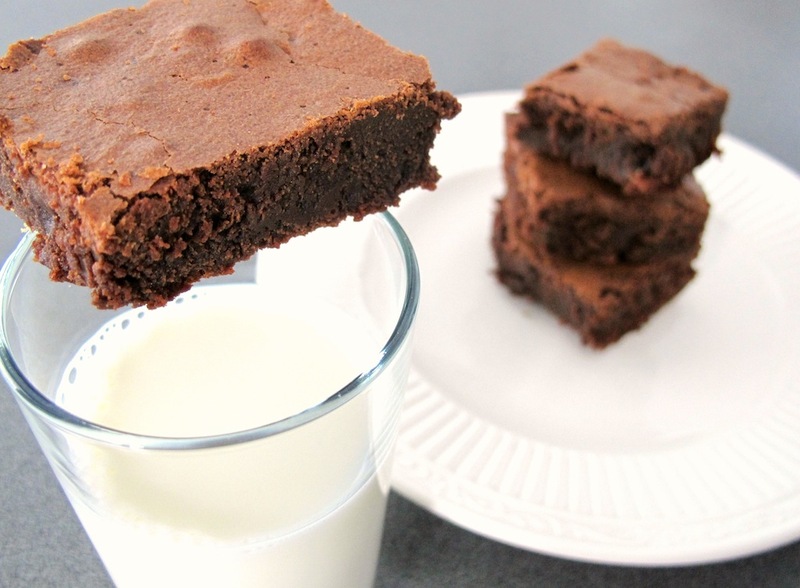 Forget the tiny squares of chocolate, I want a giant square of these dense, fudge-like brownies. *Note: this recipe was slightly adapted from The Brown Eyed Baker which was adapted from an America’s Test Kitchen recipe. 1. Preheat the oven to 350F. Grease the sides and bottom of a 9″x13″ baking pan. 2. In a small/medium bowl, whisk together the flour, salt and cocoa powder together. 3. In a large microwave-safe bowl, layer the chocolate and butter, and sprinkle the espresso powder over the top. Microwave the chocolate in 30 second increments, stirring after each round until the chocolate is melted and the butter and espresso are all thoroughly combined. [alternately, you can melt the chocolate, butter and espresso in a double boiler, but I’m lazy]. While the chocolate mixture is still hot, add the sugars and whisk until the sugars are starting to dissolve. The mixture should be allowed to cool a bit to warm/room temp so it doesn’t cook the eggs. 4. Add 3 of the eggs to the chocolate and whisk BY HAND until combined. Add the last 2 eggs and vanilla and mix again. You want to mix just until everything is incorporated because over mixing will cause the brownies to be less fudge-like. 5. Slowly add the flour mixture to the chocolate, using a wooden spoon or rubber spatula. Again, mix just until everything is combined. 6. Pour the batter into the greased pan and smooth out the top. Bake for about 30 minutes, rotating the pan at 15 minutes (I forgot to do this and they still turned out fine). The brownies will be done when a toothpick comes out mostly clean but with a few moist crumbs.